Les Ombrages är en camping i Dallet, Puy-de-Dôme, belägen vid en flod/ en bäck. Campingen har platser med stängsel och med skugga. Les Ombrages ligger i närheten av en stenstrand. Det finns möjlighet att hyra tält, husbilar och vandrarstugor. På campingen finns en ett sportområde. För den sportige semestervandraren har campingen olika cykelleder. Det finns ett underhållning. Campingen förfogar över en utomhusbassäng och ett knattebad. I den närliggande omgivningen kan du också simma en flod/ en bäck. I Les Ombrages är det tillåtet att åka forsränning/åka kajak/åka flotte. Pitch - 2 persons, electra 6 amp. Denna inspektör gör varje år ett besök på Les Ombrages och inspekterar campingen för ca 200 faciliteter och för andra förekommande punkter. Inspektören är en medarbetare från ACSI och arbetar inte för campingen. Stayed here late Aug just out of ACSI rates. Hugely overpriced for what was available. Toilets without seats and toilet paper, and only a couple of showers and WC open. Food and drink outlets closed. However the number of showers/WC available was not a problem as there was only one other touring outfit on site. A site with great potential but strangely eerie and lacking atmosphere due to its emptiness. From the greenness and lack of yellowing marks usually defining where camping has taken place, they may have been this quiet all summer. Will not return. Used this campsite as a stop off on way back to Dunkirk. Stayed two nights. The electric kept cutting out, very low amps. Box damaged, so easy to switch it back on. Toilets very small! "reverse in job!" Laundry sinks, the hottest water I have ever encountered on a site! Brilliant. Pity this gorgeous site is ruined by the horrible people who manage it! The pitches are large & shady, the river is so close & beautiful to swim in. However the woman at the front desk is rude, unhelpful & bullied us for our stay. We paid for internet but when we tried to use it where the signal worked (the restaurant) we were harassed and told 'BUY A DRINK OR GET OUTSIDE'. We were pushed out onto a patio that was in full sun, it was a hot summers day & the internet signal was not strong enough for it to work there anyway! There was nobody in the restaurant, we asked why we couldn't use the internet where it worked. We got yelled at again. We asked for our money back for the wifi seeing as we weren't allowed to use it. She refused. Have never met such horrible staff. Toilet block was also old and a mile away. We couldn't wait to leave. Pity as it is a beautiful location. I was surprised this site was relatively empty when we arrived, but then I realised why - this is the most unfriendly, badly managed site i have ever stayed at. The toilet block is dated and in one unit, so male/female washing up, showering, open mens urinal is all under one area. the wifi was very expensive at 5euos a night and only around the reception area - i was then told that i was not allowed to use the wifi in the restaurant area as people didnt like it - even though it was only the owner sitting in there! Because of this, and reading most of the other comments regarding this campsite, I feel that this site should be removed from the ACSI listing. This is without doubt the worst campsite we have ever encountered. Toilets had neither seats nor paper. Not all the toilets or showers were open. The washing areas were not regularly swept and were covered with plant material. The pool was closed. The sporting facilities were un prepared. The pitches were poorly grassed. Bread was available only from 9 am and the gates were locked until 8.30 am, so early bread had to be fetched by foot from the village - not good in rain or for elderly/infirm. The 'restaurant' had a very limited menu and closed rediculously early. There was no beach as shown in the photographs, this was being delivered by lorry loads of sand. The river was clearly dangerous for swimming. And the MOSQUITOES were deadly, vicious, the worst we have ever encountered. On one evening without warning the caretaker sprayed all the trees around the pitches with poison. Very disappointing for a dutch run campsite which are usually of a high quality. Vill du boka campingen Les Ombrages eller få mera information? Det går bra med nedanstående uppgifter eller via campingens webbsida. 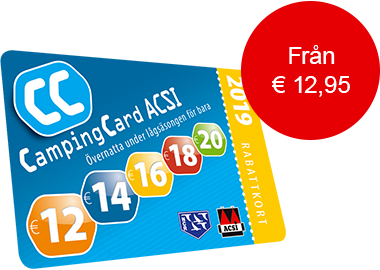 ACSI Eurocampings skickar din informationsförfrågan till "Les Ombrages".